Yep. That's guacamole. Lots and lots of guacamole. With dolls on top. And a real miniature bonfire. See, it's a beach. Guacweiler Beach. Right? Guac Bowl, we think we love you. So we're sitting around, not doing a thing, when a pal mentions Guac Bowl to us. We perk up, because we are hard-wired to perk up at any dip-related topic. Yes, Guac Bowl, he continues. It's an invite-only party here in town where people create outlandish yet edible works of art based on, yep, guacamole. It happens every Super Bowl Sunday and every Super Bowl Sunday the entries get more and more huge/silly/strange/sinister/extraordinary/sad. We were intrigued, so, with a bag of tortilla chips at our side -- okay, we ate the bag first -- we followed the online crumbs to the incredible Guac Bowl site, where we beheld creamy wonders aplenty. 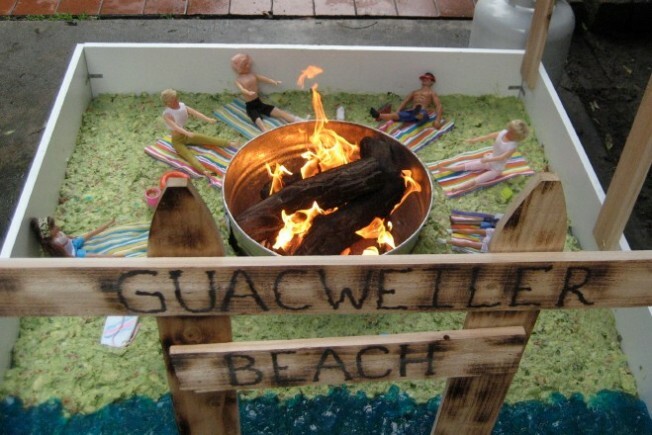 Guac-king Stuffers, guacamole with crumbled candy canes, served before a fake fireplace. Guaczilla, with the avocado skins serving as the monster's skin. Pop Guac, guacamole made with -- wait for it -- Pop Rocks. Guac 'Em, Sock 'Em Robots, fighting it out in a ring of guacamole. Plus A Guacwork Orange, and Guactoberfest, and The Guac Ness Monster. Wow. We'd say clicking on each of these images leaves us with a pit in our stomach, but then, that would be too easy. The host? Mr. Adam Pava, who writes cartoons (of course). The guests? Uber-creative, quick with the puns, sometimes football fans and sometimes not (our pal, who attends every year, says some people watch the game the whole time, some people linger by the guacamole displays). The vibe? Nothing to mock -- or, um, guac. Just lively souls who like to make food that is amusing to look at and (maybe, depending) fun to eat. The awards? Hilarious and dead-on (we like the Icarus Award, for those efforts that reached for the heights and failed miserably).